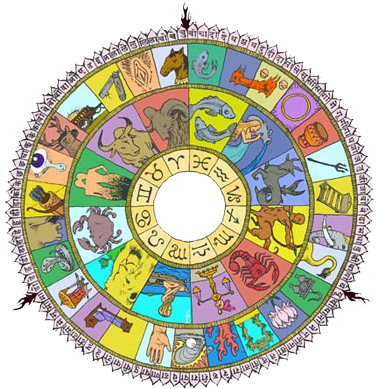 Jyotisha is the Sanskrit word for what is called Vedic Astrology in the west. Jyoti means light, and Jyotisha is the study of the lights in the sky as well as the light within. The Devas (or gods) are the light, they represent positive qualities within us and within the world, which we are a reflection of. Jyotisha is the science to help us remove all that stops our light from shining and therefore the science that shows us how to shine, to reach our full potential. Jyotisha is the eye of the Vedas, it is what helps us to see the path of life, and it lights the path. Jyotisha is a sister science with Yoga and Ayurveda, it is said that Jyotisha shows us the path, Ayurveda keeps us healthy along the path and Yoga (in its various forms) is the way to walk the path. They all work together and have the same philosophical foundations. Jyotisha can help one find the right branch of yoga to pursue, and can help to create an Ayurvedic routine that will prevent diseases that have not even arisen yet. Jyotisha is a complex science as it is interpreting life, and life is filled with many complexities. It takes many years to learn, and is a path that opens the eye to understanding the inter-relatedness of all things in a synchronous universe. See the DVD trailer of Freedomji Lecturing on Healing with Vedic Astrology at the 2009 Yoga research Society Conference.